Joe Tyburczy is a California Sea Grant Extension Specialist located in Humboldt County, and one of the lead investigators in an effort to better understand the effects of ocean acidification in Humboldt Bay. This project weaves together monitoring of both carbonate chemistry and the distribution and abundance of eelgrass in Humboldt Bay to properly assess ecosystem health and the status of seawater chemistry in regards to ocean acidification for aquaculture businesses. In this interview he shares early results since the Burke-o-Lator’s installation in May 2018. What is the Burke-o-Lator, and how does it relate to ocean acidification? Burke-o-Lator setup in the Hog Island Oyster Company hatchery. Photo credit: Eric LeBlancThe Burke-o-Lator is somewhat of an informal name, which combines the name of the inventor, Burke Hales, a professor in oceanography at Oregon State University, plus the concept of a coffee percolator. This sophisticated instrument analyzes the chemistry of seawater in real time. It provides detailed and accurate measurements of the carbonate chemistry of seawater, which is vital to shell-building marine organisms, such as oysters. Currently, very few deployable ocean instruments can directly measure carbonate chemistry. Instead it is commonly estimated by measuring pH, temperature, and salinity to make a rough estimate. The ability of the Burke-o-Lator to continuously measure carbonate chemistry makes for an invaluable resource to quantitatively measure ocean acidification and investigate its impacts. What is ocean acidification, and why is it important? Ocean acidification is directly related to an increase in human-induced carbon dioxide (CO2) in the atmosphere. Approximately one-third of CO2 released into the atmosphere is absorbed by the ocean and dissolves into seawater. When CO2 combines with seawater, various chemical reactions take place, resulting in lowered pH and less carbonate available for shell-building organisms to form shells. Oyster larvae and juveniles build their shells out of aragonite, a form of calcium carbonate that is more susceptible to and easily dissolved by acidic, low carbonate seawater. These organisms are among the most vulnerable to changing ocean conditions, which makes growing them difficult under current and predicted scenarios. The new bivalve hatchery in Humboldt Bay, Hog Island Oyster Company, and other hatcheries worldwide, have growing concerns about ocean acidification. Not only is this problematic from an aquaculture perspective, but on a global scale for entire marine ecosystems. Since the installation, what have you seen? Ocean monitoring instruments have been deployed in Humboldt Bay and nearby open coast for years by the Central and Northern California Ocean Observing System (CeNCOOS). These instruments suggest that the pH of seawater on the open coast frequently drops below 7.75, a threshold when aragonite saturation state is roughly equal to one. When the saturation state of aragonite drops below one, it means the water is corrosive to aragonite and will actively dissolve it; the higher the saturation state, the easier it is for animals like oysters to build their shells. Measurements from CeNCOOS instruments indicate that the pH in the Bay generally remains above the 7.75 threshold. However, oyster larvae and juveniles have difficulty building their shells and surviving unless the aragonite saturation state is well above one, and they grow much better when it is two or higher. With the Burke-o-Lator in Humboldt Bay, we have been able to start collecting data on aragonite saturation state, rather than estimating it based on pH. The initial data is interesting, and a bit concerning. We see that aragonite saturation is generally less than two, and frequently dips below 1.5 which can be particularly harmful to juvenile oysters and larvae. Based on this data, the Hog Island hatchery has begun buffering the seawater they pump into their facility with sodium carbonate to increase the aragonite saturation state and pH, protecting their juvenile and larval oysters and helping them grow. What does this mean for the broader Humboldt community? Understanding the effects of ocean acidification is a rapidly expanding field. There is a lot of active research into how the consequences of human-induced carbon emissions will affect different facets of the marine environment. Having the Burke-o-Lator in Humboldt Bay allows us to monitor the current conditions and how they vary through tidal cycles and seasons. With continued monitoring and analysis, this resource will give us insight into what is occurring in the open ocean and how that translates into the bay for the health of the ecosystem and the future of bivalve hatcheries in Humboldt Bay and beyond. How does the Burke-o-Lator data accompany eelgrass monitoring in Humboldt Bay? Previous work suggests that eelgrass may be act as a buffer by taking up some of the excess CO2 in the water column, and raising the aragonite saturation state for shell-builders. We have deployed oceanographic instruments inside and outside of eelgrass beds and will analyze water samples with the Burke-o-Lator to understand the capacity of eelgrass to chemically modify seawater as it moves through eelgrass beds with the tidal cycles. Interestingly, preliminary data from other regions indicate that eelgrass may not be doing as much to mitigate pH and aragonite saturation, as expected based on prior work. 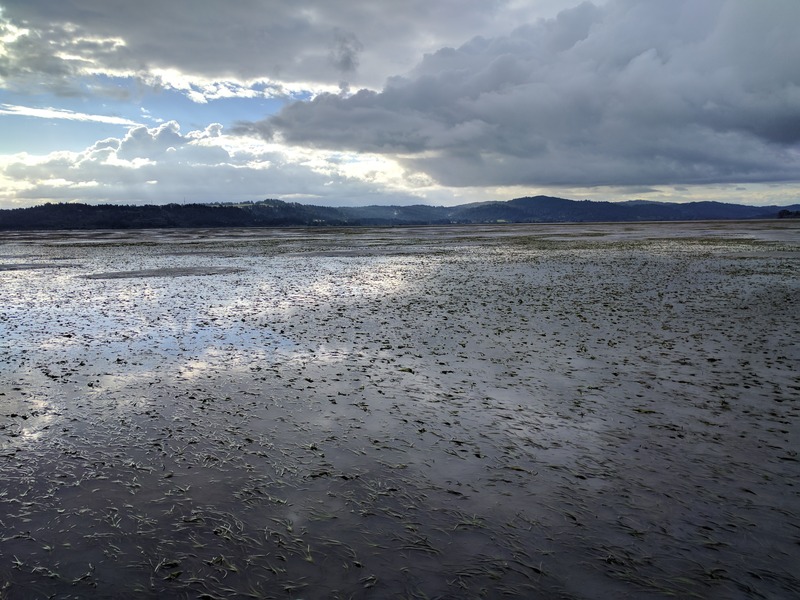 Once we are able to process our samples, we should get a better idea of how eelgrass in Humboldt Bay, one of the most extensive eelgrass beds on the West Coast, is affecting seawater chemistry and responding to changes that are predicted under future scenarios. What’s next for the Humboldt Bay Burke-o-Lator? We have set up training sessions for Humboldt State University faculty, graduate students, and other researchers to provide access to the Burke-o-Lator and enable them to process water samples for thesis work and other experiments. This was a great way to engage local people and gain experience with this instrument, which is not only a tool for real-time monitoring, but a hands-on method to measure ocean chemistry from samples collected during experiments and from other locations. In this way, it has the potential to complement and enhance ongoing ocean acidification research including oceanographic cruises and experiments at Humboldt State’s Telonicher Marine Lab in Trinidad.